Arab American Association of New York seeks to work with youth of the local Bay Ridge community. Through our youth programs and services, we hope to engage youth to participate in their local communities as well as community advocacy for human rights. The Youth Racial Justice Program (YRJP) was first started in the spring of 2016 as our marginalized communities began to suffer under increasing repression. YRJP aims to address the pressing social issues as well as the history of racial justice nationally and internationally. The curriculum works to get students thinking critically about these issues and how to engage the community in bringing about further awareness surrounding them. Youth will get the chance to discuss their own experiences and these pressing issues at hand in safe spaces. Students will also get the chance to organize split themselves up into committees where they will get the chance to take action on matters most important to them. The summer session of the Youth Racial Justice Program will be held on Mondays and Wednesdays from 3-5PM. For more information, please contact our Community Organizer at youth@arabamericanny.org. Sally Idris, Youth Development Intern, talks about racism and discrimination that immigrant youth go through especially for Arab and Muslim youth. 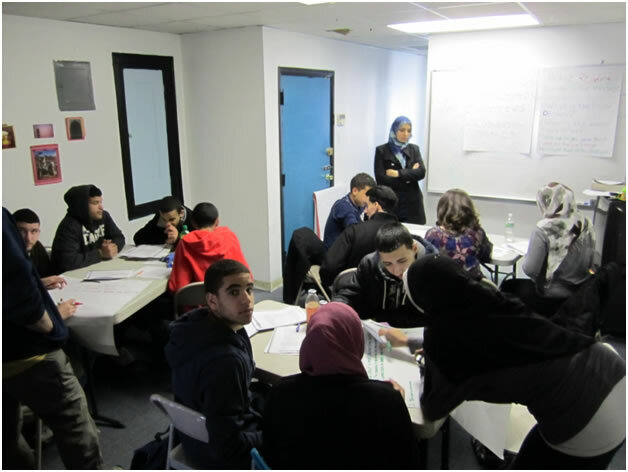 We encourage youth to work on some of the most exciting and relevant issues in NYC and nation-wide, including advocating Congress to pass comprehensive immigration reform, ending the NYPD surveillance program of the Muslim-American and Arab-American communities and raising the political awareness and activism of your community. If you want to receive updates and information on upcoming events, actions, and rallies please email our Community Organizer Noha Mahmoud at noha@arabamericanny.org. Young women of Brooklynat participated in National Arab American Service Day at Jacob Riis Beach. Brooklynat establishes a weekly discussion circle where young women ages 15-25 can discuss issues that are specifically relevant to our community. Conversations would stem out of discussions on identity, how to recognize systems of the patriarchy working within our cultures and communities and how to sensitively combat them. These conversations can happen by bringing in facilitators with the expertise to discuss the topic at hand, or through visual presentations and film discussions. We choose women mentors in our community who have studied or are activists around women's issues. This program will ultimately provide space for young women to share their own experiences and use the group as a tool to become active community members. Click here to sign up today! For more information, please contact our Community Organizer Noha Mahmoud at noha@arabamericanny.org.